Researchers are proving again how one incredible vegetable ends high blood pressure, even more effectively than prescription medications. And it’s not just alternative health and wellness experts or natural healers who are singing praises…Experts and scientists in Western medicine have joined the choir, to the dismay of pharmaceutical giants. Researchers in the UK from Queen Mary University in London recently released the results of a study looking at the effect of beets on blood pressure. What they found was what researchers all over the world have been saying for decades- that beets are the answer to prayers for ending high blood pressure. The study followed 2 groups of participants: those who had untreated chronic hypertension (high blood pressure), and those who were taking prescription hypertension medications but were unable to drop their blood pressure to a healthy level. The groups were then divided again, with half the participants from each group drinking 1 cup of beetroot juice every day, and the other half of each group drinking only a placebo. It was no surprise to see that after 4 weeks of the study, the beetroot group in BOTH sets of participants (untreated and prescription-resistant) ended up with a whopping 8mm/Hg drop in systolic pressure on average. This was enough to completely normalize blood pressure for most of the participants in the beetroot group. The placebo group saw no change in blood pressure over the 4 weeks. Not only did the participants wind up with healthier blood pressure, their overall vascular health improved as well: nearly 20% improvement in blood vessel dilation and 10% reduction in arterial hardening. These two factors describe atherosclerosis, a condition known to cause heart attack and stroke. If you are convinced that beets are the way to go, be advised. 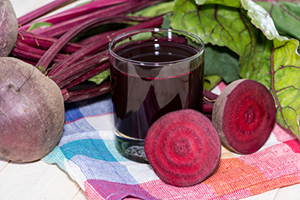 The best benefit comes from juicing the raw beet, but it’s not advised to drink it straight. The study participants had a diluted mixture. Drinking it full strength can cause pain and numbness in the throat and esophagus and other problems. The best way to drink beetroot juice is (after scrubbing everything), run a beet through a juicer with an apple, a couple stalks of celery, and about a cupful of baby spinach or cucumber. This is a healthy way to dilute the beet juice. For best results, drink it immediately. Storing it causes a reduction in the vitamins and nutrients that are responsible for the blood pressure-dropping benefits. This entry was posted in Uncategorized and tagged Beetroot juice, diet, Farmington Hills chiropractor, High Blood Pressure by tiptonchiro. Bookmark the permalink.